I ate up this nonfiction number that weaves together the history of the LA library, the histories of libraries throughout all of time, the events involving the LA library fire in the 1980s, and tidbits about the many services that the library currently provides. Anyone who knows me knows that I am OBSESSED with libraries and the many services that they provide to the communities that they serve. Have you ever thought about how libraries are one of the only places in America where people can congregate for free without having to be a paying customer? In addition to access to books, computers, and knowledge, libraries provide many essential resources and services, like tax preparation tips, to their local communities. I’m so passionate about libraries that my old coworkers used to subtly bring up the library just to prod me into my tirade about the importance of libraries — I love libraries and I love this book! This is all to say, the appeal of this book may be totally niche, but I am the perfect reader for it. Orlean is very talented in how she blends all of these histories, including an investigation into the cause of the great library fire, and modern day events together to create a brilliant nonfiction piece that is completely captivating. I talked about this book with everyone I saw while I was reading it and shortly after and I recommend you do the same! Publication Date: 16 October 2018 by Simon & Schuster. Format: Digital ARC. This entry was posted in america, education, nonfiction, Review and tagged Advance Reader Copy, ARC, book bloggers, book review, books, journalism, libraries, library, los angeles, nonfiction, reading, simon and schuster, susan orlean, the library book on August 25, 2018 by Bri with a book blog. 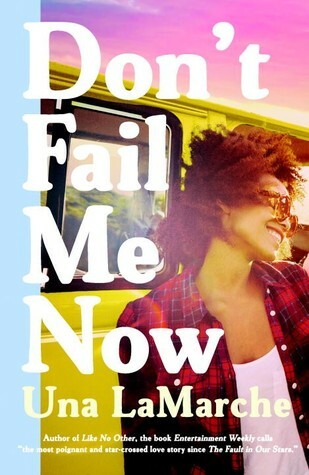 Don’t Fail Me Now by Una LaMarche was absolutely fantastic! Add this book to your TBR list immediately!! I’ve been reading my fair share of YA books this season and hadn’t really enjoyed any of them to the point that I was beginning to think that I’d gotten too old and jaded to connect with the storylines. However, Don’t Fail Me Now proved my hypothesis completely wrong! This book is going to be a lot of things for a lot of people, but I’ll settle with explaining what this book meant to me. The book’s protagonist is Michelle, the 17-year-old eldest child of a temporarily incarcerated mother and a father who deserted her family when Michelle was young. Due to her absentee parents, Michelle is tasked with raising her two younger siblings, a 13-year-old sister who is struggling with being 13 amidst all of her family’s issues and a 6-year-old brother. For the duration of the novel, Michelle’s siblings are dependent on her minimum wage income from her part-time job at Taco Bell. Those circumstances alone would be enough to give Michelle a very complicated life, but the book continues to delve deeper. The action starts when Michelle is approached by her sibling’s stepbrother… of a different sibling than the two that I’ve already described. When Michelle’s father left Michelle’s family, he shacked up with a new partner and had another daughter who is 13, the same age as the younger sister that lives with Michelle. Sound complicated, yet? The stepbrother explains that Michelle’s father is dying and wants to see her before he passes. After some grumblings, the group of five minors decides to trek across the country to see their shared, dying father. The struggles they encounter as they drive across the country and realize the differences that exist amongst the siblings are what makes this novel so spectacular. The book also lightly brushes upon what it’s like to be mixed-race and the struggle of encountering peers who don’t check their privilege. Some reviewers have pointed out that they wanted the book to explore these issues more deeply, but I felt like they were detailed enough for their points to be made and I know they’ll likely serve as an entry point to understanding those issues for some readers. If LaMarche had stressed these points further, I think the book may have come off as too preachy to some readers. I loved this book when I read it as a person in my early 20s, but I needed this book as a young teenager. As someone who had a similarly complicated life to Michelle that involved living paycheck-to-paycheck, doing more for my sibling than any eldest sibling should be asked to do, and having “secret” family members, I would have loved to have read a story that depicted a situation similar to mine. When I was growing up, I felt like my own story was so crazy that there was no way that any of my peers could ever relate. If I had been able to read a book like Don’t Fail Me Now, I would have known that, while my experience is still probably rare-ish, it’s not completely isolated and is a life that many have shared. I hope this book manages to fall into the hands of kids who have similar stories to mine and the protagonist’s and provides them the comfort and shared story that I felt was lacking from most of the books I read as a teen. Since I so clearly adored this book, I’ve already acquired another book written by LaMarche! I was halfway through reading my e-galley of Don’t Fail Me Now when I attended the Bright Lines book launch event at Greenlight Bookstore. While I was waiting for the event to begin, I noticed Unabrow, Una LaMarche’s memoir, on the table in front of me. Because I was already enjoying my first LaMarche read so much, I decided to impulse buy LaMarche’s memoir and I’ll be reading it soon! If you’ve read Unabrow, let me know what you thought of it in the comments! Expected Publication Date: 1 September 2015 by Razorbill. Format: Format: Ebook from Penguin First to Read. This entry was posted in Advance Reading Copy, fiction, Review, young adult and tagged Advance Reader Copy, ARC, book blogger, book review, don't fail me now, income inequality, Penguin First to Read, razorbill, siblings, taco bell, una lamarche, young adult on August 20, 2015 by Bri with a book blog. If I had read Local Girls during winter, I probably would have given it 3 stars and I’m not sure how to articulate why, as I feel the warm rays of sunshine on my back as I type this, I’m more inclined to give it 4 stars because the mood matches the season. For anyone who has grown up with our celebrity-obsessed culture, I’m sure you’ve daydreamed about a celebrity seamlessly joining in on your fun one night, which is exactly what happens to this group of friends. They all, for the most part, try to play it cool, just as you imagine yourself doing if a celebrity were to infiltrate your friend group on a night out on the town. This is the main event that counters the vignettes of the past. Some reviewers have criticized Local Girls because they found it difficult to tell the characters apart – I think the similarity of the characters is partly intentional because most of the friend groups I knew in high school were largely indistinguishable to outsiders from the individuals who made them up… and sometimes even indistinguishable even to those who were in them. This book takes place as the girls are figuring out that they aren’t as in sync as they used to believe they were and they’re on the verge of going their separate ways to “discover” themselves. However, the majority of them don’t go to college to discover themselves as most YA books depict and maybe that’s why this novel feels odd to some readers. The natural untangling of the friend group is very slow-paced, as it normally is when these things happen in real life, and as happened to my own high school friend group after we graduated. This novel is definitely a slow burn, but it perfectly captured some very real moments that I experienced with my own friends as we went our separate ways that I haven’t seen in other contemporary novels lately. The plot mostly revolves around their, for the most part, very normal lives, which may not be for everyone, especially if you’re trying to mentally depart to an exotic place with a summer read. Side note: One of the characters in Local Girls mentioned A Room of One’s Own by Virginia Woolf in a beautiful way which caused me to instantly add it to me TBR pile as I’ve never read any of her works. Are there other Virginia Woolf related things I should read soon? 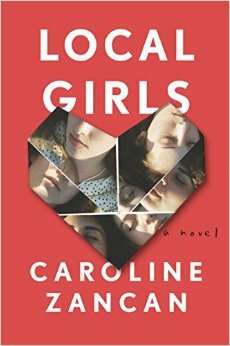 If you live in Canada, you can enter to win a copy of Local Girls by Caroline Zancan on Goodreads until 30 May 2015! If we’re not friends on Goodreads yet, add me 🙂 I’d love to get updates on what you’re reading! Expected Publication Date: 30 June 2015 by Riverhead Books. Format: Ebook from Penguin First to Read. This entry was posted in Advance Reading Copy, fiction, lady friendships, Review, young adult and tagged Advance Reader Copy, ARC, book, book review, caroline zancan, fiction, local girls, penguin, Penguin First to Read, reading, review, riverhead books, young adult on May 27, 2015 by Bri with a book blog. Disclaimer: I was provided with an Advance Reading Copy of this book for free from the Penguin First to Read program. All opinions expressed in the following review are my own and have not been influenced by Penguin. Lately, the book market has been saturated by fun, humorous, and self-deprecating memoirs written by young women. Compared to all the similar memoirs I’ve read, Alexandra Petri manages to write her version in a more entertaining and unique way. The main reason that Petri’s book stands out also makes parts of her book inaccessible: she dives deep. Petri was the nerdy child that a lot of bookworms tend to be and identify with, but the beauty of nerdiness is that you dive so deep into your particular subject that sometimes the only people who can talk to you (read: stomach you) are your fellow specific nerds. This means that when Petri spends an entire essay detailing one sect of her nerdiness, you can feel left out if you’re not familiar with the topic being discussed. However, when Petri discusses a nerdiness you experienced, reading the essay feels like curling up with a cozy blanket and chatting with your best friend on the couch for hours. 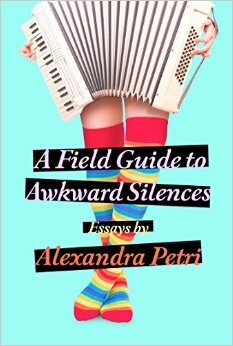 If you’re interested in finding out what you think of A Field Guide to Awkward Silences before its release date, the publisher is currently hosting a giveaway on Goodreads. They’re giving away 150 copies so you have a decent chance of being selected if you reside in the US! You can enter the giveaway until 15 May 2015. This entry was posted in Advance Reading Copy, essays, memoir, nonfiction, Review and tagged alexandra petri, ARC, memoir, nonfiction, penguin, Penguin First to Read on April 23, 2015 by Bri with a book blog.